Many fragrances have a very intensive effect on the human psyche. For example bergamot cheers up and encourages people, jasmine calms them down. This is primarily due to the fact, that aroma sensations are closely linked to our feelings. Receptors that analyze the fragrance components and forward them via electrochemical impulse directly to the brain are located in the nose. 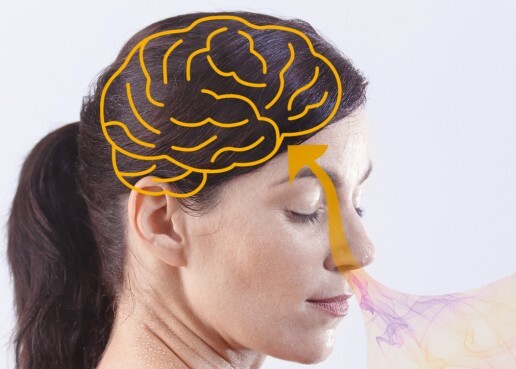 The signals of the olfactory nerve reach the brain center and affect the vegetative nervous system that controls heartbeat, respiration, body temperature, digestion, sleep rhythm and hormone release. They also affect directly the actual emotional center – the limbic system – which processes emotions and direct instincts. As a part of the limbic system, the hippocampus is responsible for establishment and structuring of long-term memory. This explains also, why fragrances cause spontaneous images and memories in our subconscious mind.